In Ramayana, Lakshmana went to the Sarayu river, ended life by engaging in meditation and stopping his breathing. It is said his soul went to Patala Loka. Similar to this, white snake like creature came out from Balarama and Snake went to Patala loka. It is belived both of them were incarnations of Adisesha serpent. Why didn't their souls go to Vaikuntha and mingle with Adisesha serpent on which Lord Vishnu sleeps? It is also said that Adisesha holds the Earth on its hoods. So, is the Earth located on one of its hoods? Where exactly does Adisesha live? Adishesha lies on the Garbhodaka Ocean. This universe lies inside Hiranyagarbh which also has 14 planetary systems. 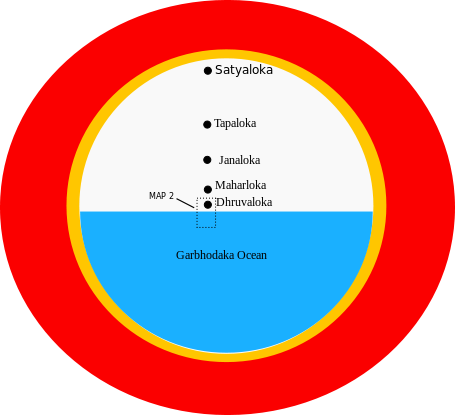 Beneath the 14 planetary system is the cosmic ocean known as Garbhodaka ocean. According to SB 5.23.9, the last planetary system is Patala. Further 30,000 yojanas(ancient distance measurement unit) below, Adishesha lies on Garbhodaka ocean but doesn't hold any planetary systems. Only under certain conditions do the planets float as weightless balls in the air, and as soon as these conditions are disturbed, the planets may fall down in the Garbhodaka Ocean, which covers half the universe. The other half is the spherical dome within which the innumerable planetary systems exist. The floating of the planets in the weightless air is due to the inner constitution of the globes, and the modernized drilling of the earth to exploit oil from within is a sort of disturbance by the modern demons and can result in a greatly harmful reaction to the floating condition of the earth. The image is taken from Wikipedia. Not the answer you're looking for? Browse other questions tagged lakshmana balarama earth adisesha . How did the serpent Adisesha become bed for Lord Vishnu?